I was so happy to be able to paint this for the Sonnier family. They visited Italy and took some great photos. But I wanted to coordinate their commissioned painting with another painting they already owned. I think they were very happy with the results! 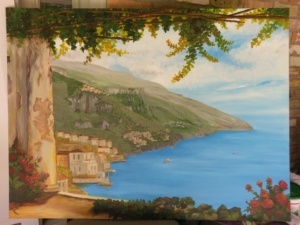 Carol painted this amazing photo of the Amalfi Coast from some photos we took on vacation this summer. In addition to capturing the aura of the Amalfi Coast and an amazing day of our vacation, she coordinated with the room and brought in some peace. (There’s a lot going on in that room!) The entire family is thrilled with her work and we will enjoy the painting and the memories it evokes for many years! Thank you. It was a pleasure to work with you and to give you “peace” as well!